Humberto Berlanga, center, wipes sweat from his face while waiting in the heat in line at the Gold & Silver Pawn shop Tuesday in Las Vegas. The National Weather Service has issued an excessive heat warning for the Las Vegas valley. Ashley Mendoza cools off in a water feature at a park Tuesday in Las Vegas. The National Weather Service has issued an excessive heat warning for the Las Vegas valley. 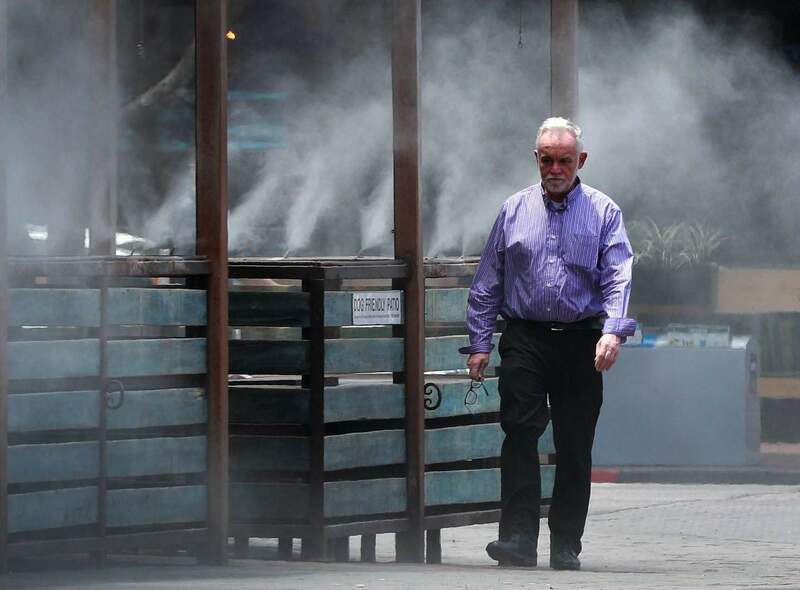 A man walks through cooling misters Tuesday in Tempe, Ariz. Much of Arizona and parts of California, Arizona and Utah are under an excessive heat watch during a week that forecasters say could prove to be the hottest of the year. People cool off with a water mist along the Las Vegas Strip Tuesday in Las Vegas. The National Weather Service has issued an excessive heat warning for the Las Vegas valley. 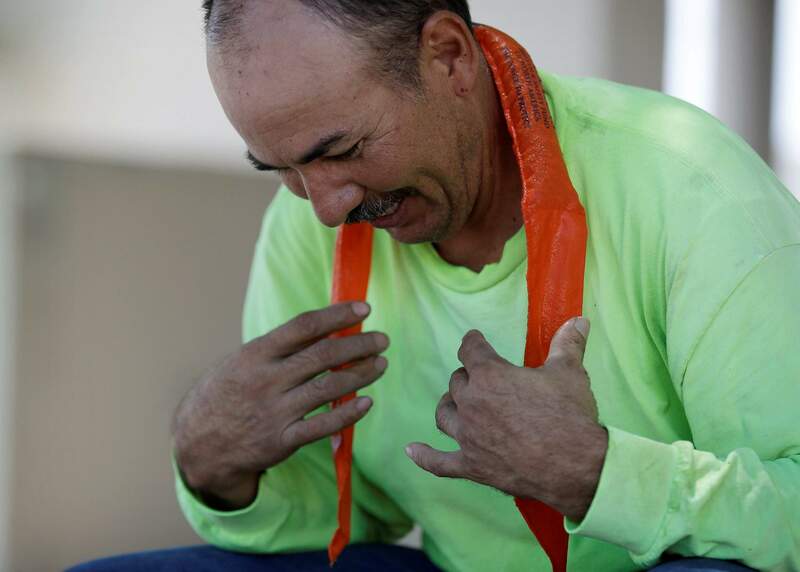 Amado Cobian puts on a wet neck wrap to keep cool during a break from work Tuesday in Las Vegas. The National Weather Service has issued an excessive heat warning for the Las Vegas valley. 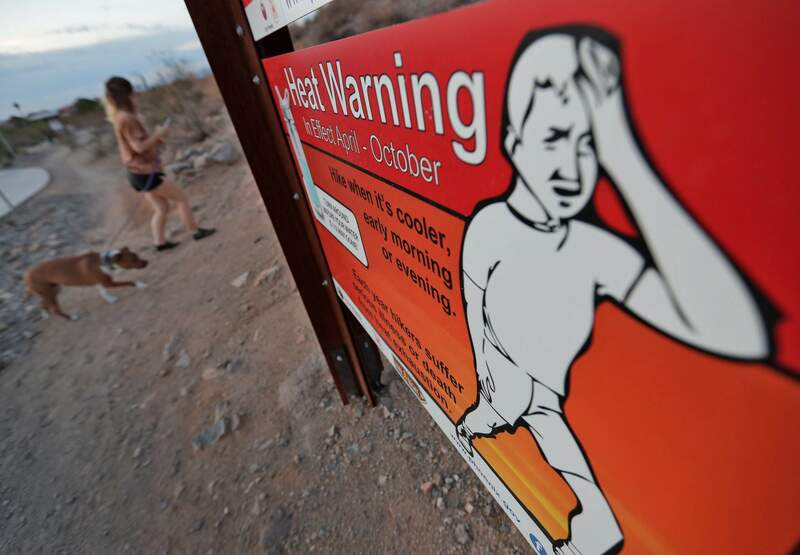 A hiker walks past a heat warning sign at dawn Tuesday in Phoenix. Much of Arizona and parts of California, Arizona and Utah are under an excessive heat watch during a week that forecasters say could prove to be the hottest of the year. 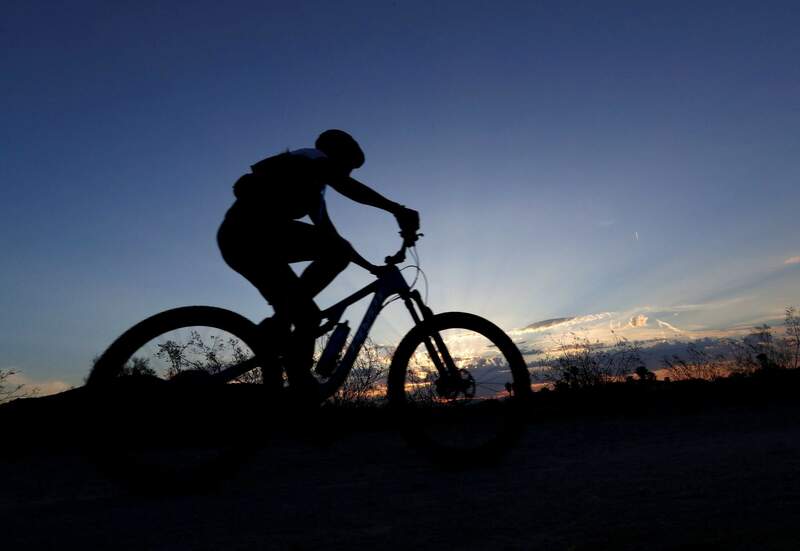 A biker hits the trail at dawn to beat the heat Tuesday in Phoenix. Much of Arizona and parts of California, Arizona and Utah are under an excessive heat watch during a week that forecasters say could prove to be the hottest of the year. 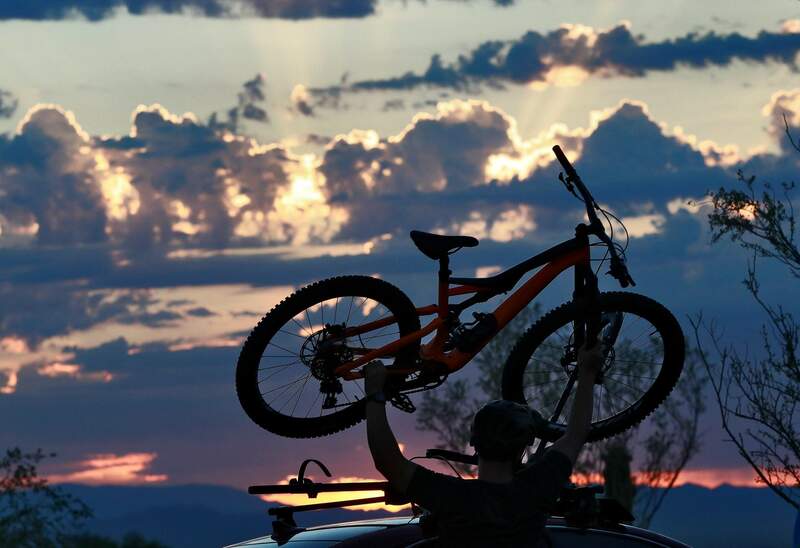 A man lifts his bike off his roof rack to beat the heat with an early start at dawn Tuesday in Phoenix. Much of Arizona and parts of California, Arizona and Utah are under an excessive heat watch during a week that forecasters say could prove to be the hottest of the year. 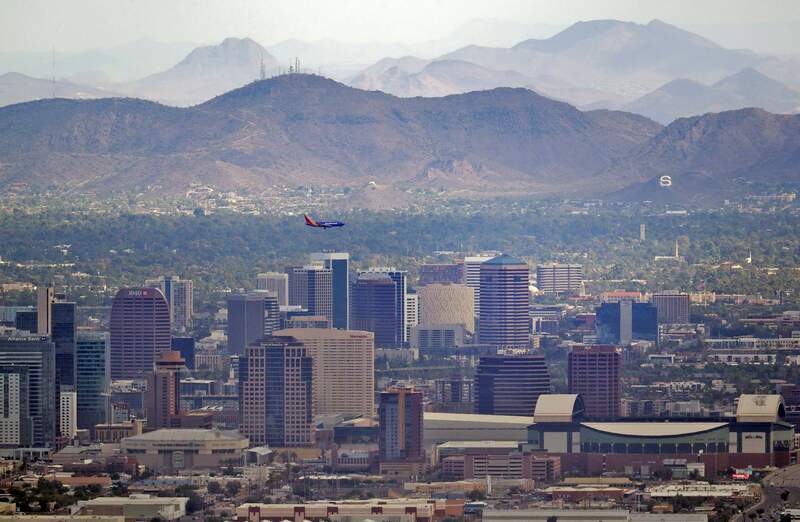 A jet comes in for an approach over downtown early Tuesday in Phoenix, as temperatures exceed 100 degrees in the morning hours. Much of Arizona and parts of California, Arizona and Utah are under an excessive heat watch during a week that forecasters say could prove to be the hottest of the year. 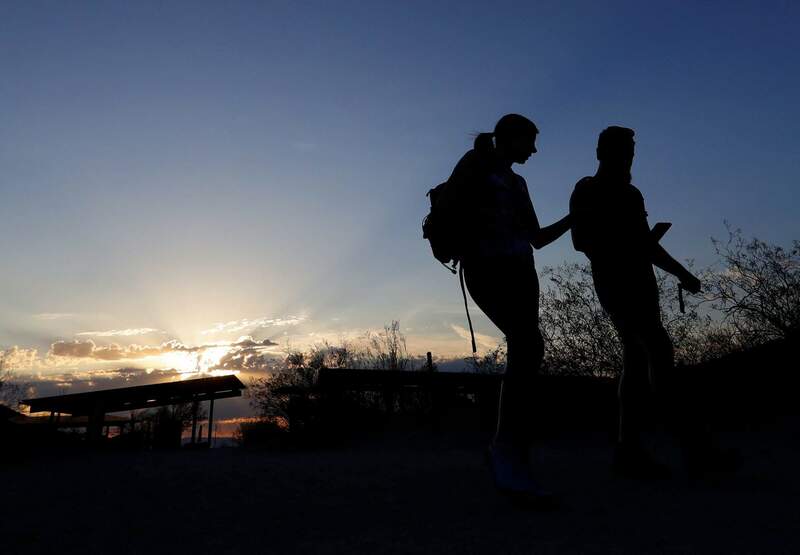 Hikers hit the trail at sunrise to beat the heat Tuesday in Phoenix. Much of Arizona and parts of California, Arizona and Utah are under an excessive heat watch during a week that forecasters say could prove to be the hottest of the year. PHOENIX – Scorching heat radiated across the U.S. Southwest on Tuesday, setting record highs in California’s Death Valley, Thermal and Palm Springs in a week that forecasters say could prove to be the region’s hottest this year. The National Weather Service said a new high of 127 degrees was set at California’s Death Valley. Weather service forecaster Chris Outler in Las Vegas said the record broke the previous one of 126 registered for the day in 1916. He said Las Vegas reached a high of 112 on Tuesday, but that wasn’t a record for the day. The weather service said other record highs set Tuesday included 122 in Thermal, in California’s Coachella Valley, and 121 in Palm Springs. Forecaster Andrew Deemer said the Phoenix high of 116 on Tuesday was tied with the previous record set in 2014. 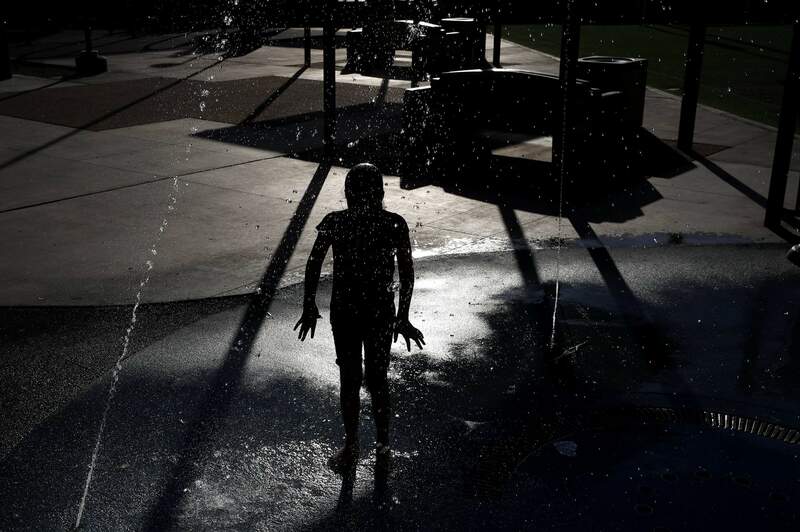 A high of 124 degrees was forecast in Death Valley and was expected to nudge up a few more degrees on Thursday as Arizona and parts of California, Utah and Nevada remained under an excessive heat warning. Highs up to 111 were expected Tuesday in Las Vegas. Phoenix was also forecast to be among the hottest urban areas in the Southwest, with highs passing 100 by midmorning and hitting 113 by early afternoon. Forecasters extended the excessive heat warning for Arizona’s Grand Canyon through Thursday, with highs in the South Rim area expected in the low 90s. “When temperatures are high, even a few hours of exertion may cause severe dehydration, heat cramps, heat exhaustion and heat stroke,” said Dr. Jeffrey Gunzenhauser, the county’s interim health officer. 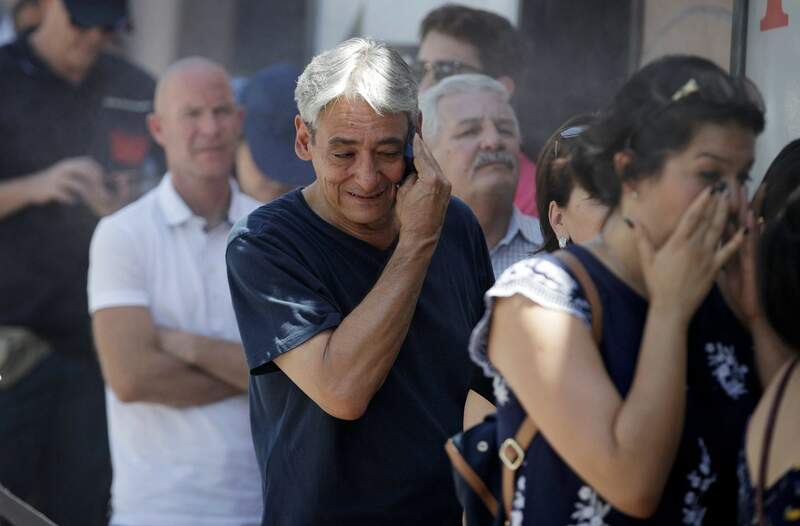 Children, the elderly and pets shouldn’t be left in homes without air conditioning or in cars even with open windows because temperatures can quickly soar to life-threatening levels, he said. Phoenix on Monday recorded a sweltering 115 degrees, breaking the previous record for the day, according to the weather service office. “Nationwide, heat is the #1 heat-related killer,” the weather service in Phoenix said on its website. “The numbers are definitely under what they were at the same time last year, so that’s a positive sign,” Fowler said.